We take client satisfaction very seriously and every two years ask all clients to complete a client satisfaction questionnaire. Our most recent survey, conducted in quarter 4 2017, was amongst 1,331 clients. In that survey 82% of clients said they were satisfied or very satisfied with our service and 84% said they would recommend us. Thank you ever so much for all your help during my divorce and the last 12 months. I know mine wasn’t the most straightforward of cases due to my ex Wife but you and your team were fantastic and I can definitely say that if either myself or anyone I know needs a solicitor I will have no hesitation to recommend you and your team. The service I have received has been great. Sian has helped me out very well, been there when I needed advice. Sian was very knowledgable in the matters that concerned me. Would highly recommend your company as been first class service. 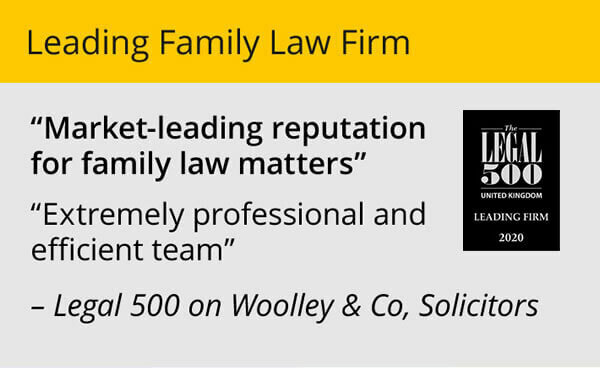 Woolley & Co Solicitors came highly recommended to me from a friend and I would now like to forward the same high recommendation to other potential clients. I soon became assured that I was in the best of hands. We cannot praise him enough for his support through many painstaking Court Hearings. He was very patient and attentive throughout the whole process. We feel he was as hopeful as we were for a fair result, feeling our pain along the way. For this we cannot thank him enough, for all that he has continued to do for us. Staff in all departments, were prompt with return emails polite, patient and always helpful with any queries over the telephone. Without a doubt if you are daunted by the prospect of going to Court for the first time then choose Woolley & Co Solicitors, you will be sensitively and professionally looked after with the prospect of a satisfying result. So finally, my journey is over in dealing with a most difficult separation, and painstaking divorce and financial proceedings. I cannot thank you enough Catherine, my confidence in you has never been thwarted during the whole time you have dealt with and resolved my legal matters. You have been so clear in your explanations, always responding quickly and in a timely way, and in terms of communications with my ex partner (where as you now things were so difficult at times), you handled this with the utmost professionalism and pragmatism. Thank you so very very much. Thank you so much for everything you did for me, I was very lucky to have you help me through the process. I will not hesitate to recommend you to anyone that needs your services. Woolley & Co and namely Rebecca Franklin were honest about the cost and always kept their word and for that I am forever grateful. I have appreciated all your suggestions and guidance over these past 6 months, especially helping me understand the process and being well prepared. Thank you SO much for all your help, reassurance, guidance and extremely professional conduct. I can honestly say I could not have done it without you, and your readiness to adapt to my personal way of handling matters was an enormous help. I will certainly be recommending you. I’d like to thank you for your professional advice and diligence in this matter; I’ve found it as painless as such a situation can be. I am truly grateful for everything you have done to help me over the last two years. Professional, knowledgeable, fully supportive, understanding, patient and always approachable and available are just a few words that describe Michelle’s style. I would highly recommend her to anyone needing excellent legal advice. Thank you for all your help and support in steering me through the process. Your guidance made getting to this point seem relatively straight forward. Once again thank you so very much for all your excellent and very professional support and help during this harrowing experience. I found Abby to be a sympathetic yet practical source of guidance, during what was obviously a difficult and emotional time. Abby was able to clearly outline available options and effectively communicate those either by phone or in writing. I would certainly recommend her to any prospective clients. Patient, understanding, sympathetic, professional and honest. With her help and support throughout this horrible and nasty ordeal she has kept me level headed and focussed throughout. Her personality, experience and know how has not only allowed me to get through the most difficult of times but given me the opportunity to move on with my life in the most positive way that I really didn’t think would be possible. I cannot speak highly enough of Abby and I would without hesitation absolutely recommend her to everyone. I would like to say again, you have been so brilliant with everything. You have kept me going throughout and I feel that now I am in a much better position to carry on with my life. I’ve just become a very relaxed man at last after using the services of Woolley & Co and especially Karen Agnew- Griffith. I was residing in Spain when I had divorce proceedings first issued against me from my wife at the time. In an attempt to save expense I made the mistake to save cost of attempting to represent myself. I did and came out with a ridiculous court order against me for Spousal maintenance more fitting to Rock star status than little old me selling a couple of wardrobes! The service from the start to finish was absolutely superb over the 12 months and thanks to Karen and the team my court order was dramatically reduced to where it should have been in the first place. My advice don’t firstly try to defend yourself and secondly call Woolley & Co / Karen Agnew Griffith! During my difficult divorce proceedings, Rebecca provided an exemplary level of service. She took the time to explain the processes in clear and understandable language, cutting through the jargon. I just want to thank you for helping me get through this horrible situation as at times I thought I’d never get to this point. I hope I never find myself in this position ever again but if I did Id not hesitate in contacting you or recommending you to anyone I know. Thank you for your excellent support and service, and I will not hesitate in putting your name forward if any of my friends/family need legal services. I just wanted to take this opportunity to thank you for all of your hard work and support throughout our application for the Special Guardianship Order; your expertise was invaluable. We would have no hesitation in recommending you to our friends and family if ever they find themselves in need of sound, legal advice. I am very happy with the outcome today, I was completely prepared to not receive 100% of the house so I am thrilled that we have obtained a good future base for myself and the children. I’m very appreciative of everything you’ve done and please pass my gratitude onto Charlotte. I felt in very safe hands today with the both of you there! Its with a true heart that i can say you have been very supportive and dealt with everything with sincerity. I thank you for every thing and I shall of course recommend your services to those who may find themselves in need. I firstly, would like to thank you very sincerely for what work you have done so far regarding my interests, and for how you have been dealing with the emotional side of it. You Have been very supportive and encouraging whilst It was a hard time of adversities for me. You have been listening and helped me at the very best of your abilities. I always, have felt secured within the strong structure of your firm. I want to thank you for your patience and diligence in the matter. I would like to take this opportunity again to thank you for all of your support over the past three years. It has been a long journey, still not yet completed, but at least with a degree of closure. Again I would like to reiterate how lucky we were to find you. We appreciate immensely what you have done for us. Hi my name is Greg I’m a father of two young beautiful girls who had to call on the expert services of Rebecca Franklin of Woolley and Co family law solicitors, I found Rebecca to be extremely helpful as she knows her stuff she was able to fill me with confidence with the knowledge she passed on to myself with step by step guidance in the correct procedure to follow to enable to get regular contact with my children. Whilst undergoing the problems of not getting access to my children I had some advice from friends to do things myself rather than pay for a solicitor but with hind sight I’m glad that I chose not to as I was never left to feel alone with the sound advice and positive action from Rebecca. Many thanks to you Rebecca Franklin of Woolley &Co. I would like to say thank you very much to Rebecca Franklin and her team for very honest and professional service I have received from her regarding my case. From the start to the very end of my case I was able to count on her and talk about my feelings without hesitation and I felt like there is someone out there who exactly understand what I’m going through and tried there best to support me and finally represent me in court in very professional way. I wanted to thank you for all your advice and support with this process. I appreciate that it has been a bit up and down at times, but your support with this situation has been invaluable to me and consequently to the children. My experience with yourself was superb from day one, from the first day I contacted you I could tell you understood. The service you provided was first class from the first phone call to subsequent letters and emails, you was professional, friendly and efficient throughout. I would highly recommend you to all my friends and family. Thank you for your knowledge, advice, support and sense of humour over the past 14 months. You always made me believe I was worth more than just my house and now I have a piece of paper to prove it. Michelle Brammer was recommended to me by a very close friend. I’d never been in a situation before where I required legal assistance, so I was of course very anxious about the whole situation. From the first phone call with Michelle I literally felt like I’d had a weight lifted off my shoulders. She was very friendly, yet extremely professional. She took the time to explain everything to me, and gave me the confidence I needed to proceed. She literally did all the hard work for me. In the end the result was better than I’d ever expected. Worth every penny and will 100% recommend. Thank you Michelle for all your help. Kate was very professional and efficient in assisting with my divorce. She was extremely compassionate towards my case which subsequently resulted in a very good final outcome and I am overwhelmingly thankful to her for helping me to achieve this. Thank you once again for all you have done. It’s been a real pleasure dealing with you these last few months, You made a virtually pointless and totally weak case into a great result. Please close my case as satisfied. I feel very fortunate indeed to have had Luci Larkin as my divorce lawyer. My divorce was particularly complex as there were jointly-owned property in the UK and abroad as well as a legal action against me in another jurisdiction. The negotiations lasted for three years and over that time Luci was completely focussed on achieving a settlement that was acceptable to me. As an experienced lawyer she was able to offer the full service and brought in other legal professionals to advise on specifics as and when necessary. A divorce is an anxious time but Luci was reassuring and responded quickly to my questions. She was always well-briefed, organised and accommodating and gave me excellent advice throughout. You have supported me through one of the most challenging times of my life and I couldn’t have asked for a better solicitor. I would like to thank you for your help and support through this process, you really have been a great help, and I would gladly recommend your service. I wouldn’t have had a clue where to start if I hadn’t contacted you, you have given me both strength and peace of mind over what started out as a very difficult situation for me, so I cannot thank you enough and would definitely recommend you. May I take this opportunity to thank you from the bottom of my heart for all your help and support through what has been a pretty stressful 4 years (almost!!). Obviously I could not have done it without you and apologise for the long drawn out process. I really appreciated having you on my side. If I ever come across anyone who needs a solicitor, I should certainly recommend you. You have been exemplary in the way you have dealt with this divorce, you’re expertise and knowledge has been country miles better than previous lawyers. You are very very good. Your support and tenacity has made a big difference to my life and I can now move forward with a future and see a positive life ahead. It has been difficult but your legal advice has always been clear and the response in replying has been exemplary. This has made a very difficult couple of years far less stressful than it could have been. I will have no hesitation recommending you to anyone who wishes to instruct a solicitor for similar matters and again thank you ever so much for your advice and support over the last 2 years. Karen has been an amazing support through this process. She has always been very clear with her advice and kept our expectations realistic. The help and advice we have received through the whole process and drafting of statements has been amazing. We cannot recommend Karen highly enough. Thank you. I am very grateful for the help and guidance Richard gave me through a very long, painful and difficult divorce. Abandoned on this island without any financial support I was lucky to have his guidance and expertise to eventually reach a fair conclusion. I can now move on with some financial security at least. Can’t thank you enough for all you have done helping me get my boys back means the world to me so thank you again Andrew. Rebecca has always given advice which was in my and my child’s best interests. She always answered any questions I had and knew the specifics of my case in great detail. Rebecca has helped me through the last two and a half years by providing outstanding work to help my case, ultimately ensuring the best possible outcome. Thank you for all of your help over the past year and the professional advice you have given me over the past 2! I will of course recommend your services to anyone and everyone in need of such legal services! Richard has been very helpful, professional and knowledgeable throughout the course of my divorce. His continued support has allowed me to understand the process, answering all my questions and eased any concerns I had. I wouldn’t hesitate to recommend him to friends and family. I cannot thank you enough for your amazing service with a smile at all times. You are the BEST solicitor I have ever dealt with and I have dealt with 1000’s trust me. You have provided an excellent service to me during these 10 months, you have answered my questions and addressed my concerns without ever rushing me towards the next step before I was ready. I’d like to thank you for your help and I would not hesitate to recommend you and your firm to other people. Thank you very much for all of your help, advice and professional services over the last year – you made a difficult time for me much, much easier! Thank you for all your assistance. I especially want to thank you for keeping our conversations ‘professional’ during the early emotional days. I would like to add that the videos on your firm’s website provided good advice. Many thanks for your support through this difficult time. It’s been really nice to have you on board and I always felt I was in good hands. I would like this opportunity to thank you for all your help, you guided me through ALL legalities and made much easier what was a difficult time for me whilst being professional throughout, Woolley & Co should pat you on the back, I give you 11 out of ten and once again thank you and I will recommend you to anyone I know who needs your professional expertise. I found Susan Harwood from Woolley & Co after calling around my local solicitors and feeling that they were very pricey. I was in the middle of a career change and had taken a significant pay cut so that I could establish my own business and needed to know that the fees were fixed. Due to the nature of my separation, and a terrible experience at work I had also been suffering from anxiety and knowing the costs upfront definitely put my mind at ease. I found Woolley & Co from a Google search as I was specifically looking for fixed fee civil partnership dissolutions. Whilst price was important to me, Susan came across as an extremely warm person and put my mind at ease immediately. This was even without having met her in person. I knew that I would not need to call any more solicitors. Throughout the proceedings, I was updated with professional and timely responses. On more than one occasion, I needed to call for clarification about the proceedings and time-frames to keep my mind at ease, and it was. For me, Susan made the experience so much more bearable as she was so helpful and willing to support me through this challenging time. Whilst Susan is based in Cornwall and myself in the North East, this did not hinder the process at all. A court was chosen in an area where Susan knew it would take less time to get the dissolution through. I knew I was in good hands even though we hadn’t met in person, I was completely reassured. The process was over in the time-frame Susan had initially estimated and I feel the outcome was completely in my favour. I would wholeheartedly recommend Susan to anybody who needs a human lawyer, sympathetic to their individual situation. The only one regret I have is not having started the proceedings a lot sooner. Rebecca reassured me at a time of uncertainty that my decisions going forward were right ones and to be confident in my actions. Very calming when talking on the phone. I have used several solicitors over the years and none come anywhere close. I could not have asked for better service and I wouldn’t hesitate to instruct again. You have made a very stressful situation so straight forward and I truly am unbelievably grateful to you. Your help, care and genuine understanding have really been a godsend to me during this time. I received a copy of the Pre Nuptial Agreement today. The service has been excellent, and I am hugely grateful for the flexibility offered with regards to payment, and for you accommodating the work at short notice. The Pre Nuptial Agreement really has been pivotal in allowing us to proceed with the purchase of the farm. I just wanted again to say thank you so much for everything you have done I honestly couldn’t be any happier for the work you have done. Once again, many thanks for all of your work and advice you have given me during the divorce proceedings and the subsequent financial settlement. You have made the process easy to deal with and done so in a professional and friendly manner. Thank you for all your hard work, help and guidance throughout the divorce process. You answered all my questions and concerns professionally. I know you saved me a lot of money, I will be forever grateful. Your service is perfect. I was always well informed without being bombarded. I was given good advice/guidance and always given time to make ‘my decision’. As with all the best legal advisers I have encountered over the years, you clearly possess that special talent of being able to apply detailed technical expertise in a pragmatic and down to earth manner – a talent that was so much needed given the differing personalities involved here! Rebecca provided an excellent legal service for me during a traumatic divorce from my ex-wife. She has that rare ability for professionalism with the personal touch, something that vulnerable divorcees need at a very difficult time in their lives. He kept me focused on the bigger picture when I could easily have become distracted with the inevitable ugliness of a marriage break-up. Richard’s wit and humour got me through many of the difficult times. His integrity and his human approach inspired confidence and I never once felt anything other than secure in the knowledge that he would protect my interests and secure the best possible outcome. You have been an oasis of calm, advising us on what was worth fighting for and what was not. The positive outcomes that you dealt with for us are a credit to your abilities, your patience and level headedness, for which we are extremely grateful. I can’t thank you enough for all you have done for us. I think its fair, proper and correct to say that you’ve carried this out wonderfully and with vigour! Luci was fantastic. She was pro-active, a great listener and explained things in terms I could understand. When needed she held my hand through the process and now I am out the other side, feel it was worth it. It has been a great help to have this matter dealt with in such an efficient and sympathetic manner. I would have no hesitation in recommending your services. Thank you very much for the first measured, no nonsense advice I have received since beginning on this sad journey towards divorce. I have spoken to a lot of lawyers before finally getting good advice from you. Michelle’s attention to detail is second to none and her guidance and reassurances along the way have helped me get through the whole ordeal. Thank you so much for all the help and guidance you have given me during the proceedings I really have appreciated your expertise. Thank you so much for your professional help and the wise and supportive relationship you’ve given me over the past two years. I do feel happy with the outcome and your experience in dealing with my case, when I was about to give up you kept me going. It has been without doubt, the most difficult time of my life but your understanding and empathy is to be commended, you gave me reassurance and hope when I needed it and your advice was always spot on. Thank You for making the last 8 months go smoothly, your advice was always excellent and you made a very trying experience much more bearable. – the right balance of sensitivity and understanding mixed with huge enthusiasm, professionalism, knowledge and skill. I think that you are also very gifted in forming an excellent rapport with your clients irrespective of colour or creed. Thank you, thank you – without them (friends), or in fact you, the new breed of lawyers, I would not be able to cope. You have been such a force of strength to me, and I know many other people, I salute you and your knowledge, common sense and humour, Well done Woolley & Co. Your company and in particular Alison Ratchford have been thoroughly professional. I can’t find fault in anything you have done. Alison restored my faith in your profession. 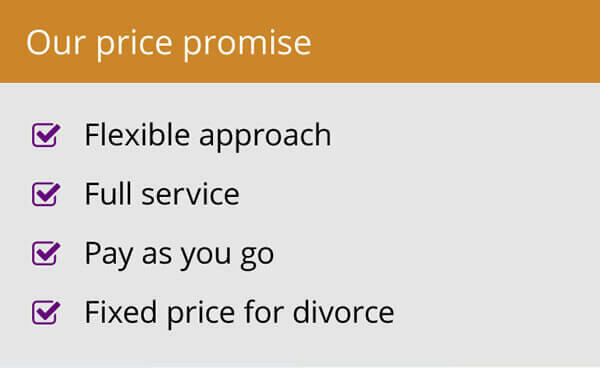 I am a delighted customer who will certainly recommend you to anyone who has to go through the pain of divorce. I am so grateful for all your help, advice and guidance – you have been absolutely brilliant! I don’t know what I would have done without you! Having had time to consider everything I now believe that the deal you achieved was actually much better than I thought it was, and much better than it appeared on paper on the day so I am very happy! Communication was by email- this was to facilitate convenience and my preferred way of communicating as I had a full time job. I would like to say I would use her again but I’m not planning on getting another divorce, however anyone looking for a good divorce lawyer should look no further after reading this. Even though I am in a different country, you were very prompt at answering all my questions and solving any queries I had. I would definitely recommend you and your firm to my friends. Thank you for making this process as simple as you possibly could…. with your experience time and commitment it was very easy. Thank you for all your support through this process and making it seem so seamless. Your work ethic and keeping me up to speed on top of getting the consent put together was brilliant. I much appreciate all of your guidance and advice over these past several months. You have always provided wise and balanced counsel, thank you. You made a thoroughly unpleasant episode in my life considerably brighter by your input. I shall have no hesitation in recommending your services. I cannot thank you enough for today, you were so compassionate and accurate with our needs and managed the meeting brilliantly, thank you, Trace. I have received cafcass report with very positive feedback. I am also being allowed access to my son now. Thanks once more for great representation and handling of my case. Many thanks for all your help with my divorce, it was a great relief to have you on my side through this. Abby your advice has been really helpful to me and I want you to know I really do appreciate everything you have done for me. Abby just so you’re aware I would highly recommend you to anyone of my friends and family, or indeed anyone who knows me. Woolley and Co handled everything brilliantly and I can’t thank them enough for helping me through this awful past two years, especially Nick Wiseman. I’m divorced! Wherever you are this evening, raise a toast to one of the smoothest and amicable divorces I’ve ever heard of – thank you so much. Kathryn personally you listened to my issues and gave the best advice possible ensuring the least amount of stress on my part. I don’t wish heartache for any of my friends, but can assure you if they do have any issues I will give them your details. Thank you for your continued support, I wish you and all your staff the very best for the future. Karen demonstrated a high degree of professional expertise. Her explanations of the position I was dealing with were always clear and immediately understandable. Her approach and style of communicating was open and she willingly gave her time to responding to my many questions. It was the best service I have ever used. Personnel were very helpful in each step. Received lots of information how to deal with divorce and what to do after. The best thing I liked that it was dealt very quickly. I would not hesitate to recommend Rebecca’s services. I used Rebecca in a high equity divorce case and found her to not only be effective and robust but also very sympathetic and supportive. I owe the success of being able to maintain my successful business to Rebecca. Thank you also for all of your assistance with our divorce which was a very smooth process thanks to your guidance. Abby listened to our complex case with compassion. Her on going support and advice has been exceptional, she always returns E-Mails promptly and telephones when arranged. Her support throughout this harrowing ordeal has been invaluable and we couldn’t have asked for more from any lawyer. I spoke to Tamara today and she told me more in 2 minutes than the solicitors and barristers have done in 7 months. Abby was recommended to me and from that very first call, I was very happy I’d found the right person. She was sympathetic to my situation but told me as it was and in a way I could understand. I would highly recommend Abby to anyone. I found Abby very helpful when I was going through a stressful time. The final outcome was as good as I could have hoped for under the circumstances. I have found Davina to be personable, purposeful and methodical in her overall approach throughout the long and emotionally trying period of my recent divorce. Always prepared to go that ‘extra mile’ I will certainly recommend her services. I really believe that you have made the whole situation so much easier and less stressful thanks to your professionalism and friendship. Thanks for all your work on this matter, clearly effort above and beyond the call of duty. Is there anyway to recognize your excellent services on a professional basis? Lawyers Order of Merit or something? 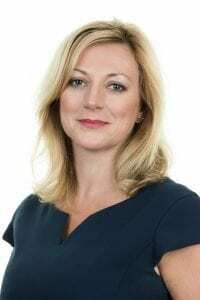 Kimberley provided guidance in the right direction and encouragement – along with great expertise on the complexity of the legal side to the case. The service given was second to none and required minimal input from myself which was very important for me during this busy time. Richard brings a great deal of expertise and professionalism, is personable and pragmatic, I have no hesitation in recommending him. A 5 star service. I would like to say Claudette you have been brilliant and I thank you very much for all you have done to help me and my daughter to keep the family home. We are extremely satisfied with the service you have provided. And would strongly recommend anyone to contact you, don’t hesitate! Fantastic Nick, you’ve been great through all this, thank you for everything. I know it’s your job but I really do appreciate all that you’ve done for me. Kimberley Bailey is an excellent lawyer. I felt very confident with her ability and expertise, she is a strong person to have helping you but still shows compassion which is ideal for the job she does. Words I would use to convey how Kathryn operates… would be reassuring, knowledgeable, strong, confident, capable and empathetic. I would thoroughly recommend Kathryn McTaggart to anyone finding themselves in a situation requiring an outstanding Family Law Solicitor. It was a great result and I have you to thank for that. I couldn’t have achieved what you did today on my own and I’m very grateful. You did me and the kids very proud today. I’m so very grateful. I would like to take this opportunity to thank you for all your help and understanding over the last (almost) 2 years. Your professional help and mannerism has been greatly appreciated. Everyone has worked so hard in my interests. I don’t believe the outcome would have been as good should I not have had all of the support that you all have given me. You have been brilliant and very supportive throughout and it has really been appreciated! Hopefully I won’t need your services again, but if I do I would not hesitate in coming to you. You have done a brilliant job on my behalf and I am truly grateful, the service I have received has been second to none. Kate and her team were very honest … This honesty kept me grounded in reality and prepared me for the legal long road that my former spouse forced us down however Kate and her team kept me appraised of my options throughout, both financially and legally. I would like to take this opportunity to thank you for making what has been a pretty stressful time for me as painless as possible. Your knowledge on the procedures and laws involved with divorce is second to none and I think you have dealt with all the issues in a very professional manner but also with a personal touch. I am filled with gratitude, and I would like to thank you for agreeing to represent me when I approached you with such a complex case. You have truly come through on this, and I have great respect for your craft and by your skilful work – saw this matter through to a successful conclusion. Thanks for all your help over the last year or so. You have no idea how much your sage guidance has been appreciated in seeing these matters to completion. You have made it much easier for us to navigate through the legal minefields and reach the solution that we hoped for. Your combined kindness, knowledge and clear guidance made a big difference at such a difficult time and it is great to be able to recommend you to others. Kathryn made me feel extremely comfortable and confident when dealing with my divorce queries. I specifically used Woolley & Co because Kathryn worked there. Amicably resolving all parties’ issues for the benefit of all is what Ian strives to achieve. Talking through the issues is the best solution and Ian willingly gives his time. Plus Ian is a person with whom it is always a pleasure to talk with. Ian is one of those rare legal practitioners who actually puts the needs of the client first. He delivers on his promises, is well versed in his subject matter and above all goes about his business in a extremely professional manner. I have no hesitations in recommending Ian to my network of friends and associates. Nick Wiseman came across as very genuine and exceeded my expections in the way that he dealt with my case and the advice he gave. He genuinely made me feel that his approach was to give me the best possible service and advice without charging me unneccesarily. I am absolutely delighted with your service, over the moon in actual fact. Many thanks again, Luci. I will now come to you with any legal issues or advice I may need. Thank you very much for your help and advice. 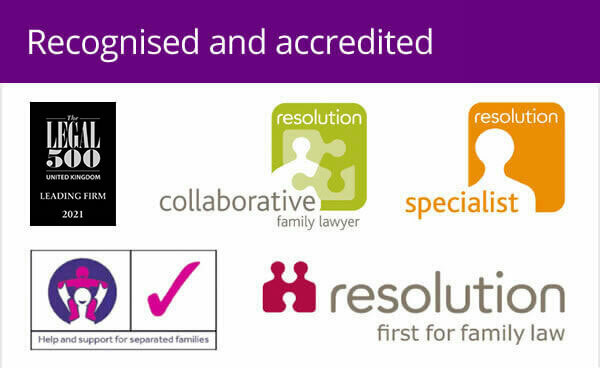 I would certainly recommend you to someone who was looking for a family law solicitor. Thank you! Thank you! Thank you! Thanks to you and your team’s professionalism, my daughter and I can finally start to make plans for the future. You have made the whole process of having an international custody battle fairly pain-free and very quick. I would and will recommend you to everyone. I was extremely pleased with the service you provided. You made me feel comfortable and relaxed about the situation I was facing and your reassurances helped me greatly at the time. I’m convinced your professionalism helped bring the matter to a swift and favorable conclusion for me. Firstly I must thank you for setting my mind at ease with your initial conversation. Again thank you so much the difference with my current solicitor is 1000% better. Richard is a first class solicitor who provides pragmatic and sensible advice to his clients. His abilities rival any solicitor in the large Birmingham firms. I cannot recommend him highly enough. Nick Wiseman was quickly able to offer support and guidance for my personal situation, whilst 5 other European practices in Belgium were unable or unwilling to help. I would like to take this opportunity to express my heartfelt thanks to you for your professional help and support. Your skill in managing my case, from house, divorce and children issues have always been to the highest of my expectation. If I could give 6 stars for Kate I would do so. She was worth every penny spent and is a true credit to your company. Thank you for everything Quyen. You have been really supportive and professional throughout. I would indeed recommend you and your company should the opportunity arise. I would like to once again thank you for all the very professional and friendly advice you have given me over this very difficult period; it is always easier to deal with someone who makes you feel more at ease. Thank you again Claudette for your assistance. I think you’ve been brilliant and will definitely be recommending you to all my 30/40-something friends having a midlife crises and heading for a divorce.